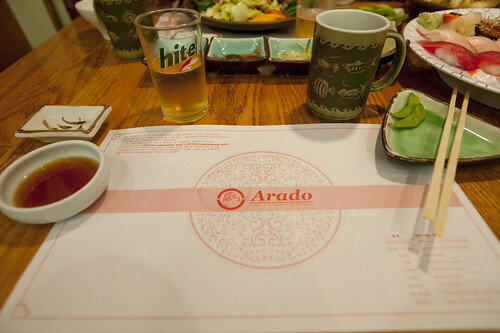 ..and a placemat with Korean warnings about things in the food, and a lovely little beer glass with Hite, the Pabst Blue Ribbon of Korean beers (and wonderful for that..I’ve had my share there in Seoul). 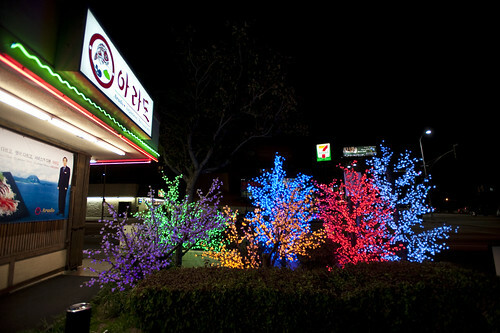 This was taken at Arado Restaurant, Whilshire and Wilton in Los Angeles. 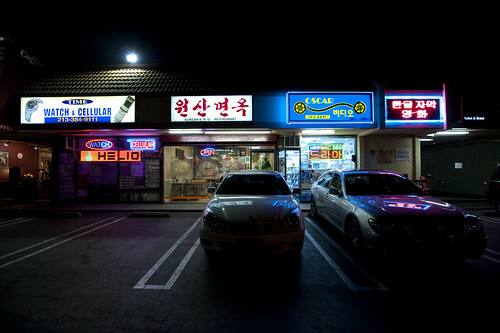 A great Sushi (I guess..) restaurant on Wilshire and Wilton in the prototypical mixed use mini mall in Los Angeles. Four grown adults well-served with entrees, appetizers, plenty of better-than-good American sushi, beers, the works for $109, tax excluded. That’s reasonable to me, considering the next night, two beers and two sausages at the hipster downtown spot set a couple back $32. But, what I found most intriguing about this place was that it was own and run by a Korean couple. Whilst I did not find out the motivation behind opening a Japanese style restaurant with sushi bar in the borderlands of Los Angeles’ Koreatown, I was curious. I wonder — where and when do these kinds of cultural borders get crossed and where are they allowed to transcend the typically hard-and-fast boundaries they define? Why do I blog this? Curiosity about where and under what circumstances culture transposes. Would it have been less strange for you if the couple was american and opening a pasta restaurant? or British and opening a French restaurant? Hmmm..good question. I think it would be strange, differently. Food cultures are one of those things that swing between thie peculiar kind of authenticity — the “original” culture is exhibited. One might say something like — if you want “real” Brazilian highlands food, go to this place. Something like this. On the other hand, there are these “fusion” genres that remix and mashup food and culture and technique and so forth. It would be differently strange I guess if you sat and pondered the relationship between the cultures and why a remix might occur. I’m over thinking this, but what I found most interesting here was the casualness of the remix. So, the placemat is written in Korean (except for the restaurant name), and the beer is served in this glass with the name of a Korean beer brand. There is Edamame to whet the appetite, as well as pickled veggies, which I thought of as more Korean, but I could be getting that bit wrong. When I lived in New York City there were these curious burrito counters that were run by Koreans, or owned / managed by them, but the counter help was Central American. Intriguing transpositions. A peculiar Near Future Laboratory observation object. 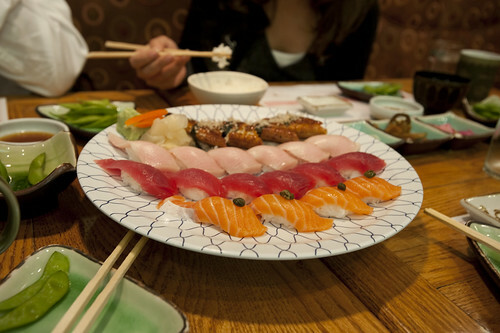 Most Japanese restaurants that we can see in North America and Europe are owned by chinese. About your particular experience, pickled veggies exist in Japan and are quite common. In fact if you look at the two cultures (I have been traveling a few times in Korea), there are many many similarities in food, politeness, traditions, social relationships, etc. The good thing with this kind of “surprises” is that it helps to reassess our own knowledge and beliefs.